Hallownest, the kingdom of old, lies in desecrated ruin beneath the discarded town of Dirtmouth; but, as primordial forces stir, and creatures start to repopulate amongst the rubble, this derelict becomes a shadowy frontier that entices the adventurous, curious, and brave. You control a mysterious vagrant knight who wears a ghostly visage and wields a blade called "nail." Shed behind your reality, and molt yourself anew, bringing yourself down to the level of mere insects—literally. Hollow Knight is the masterful fusion of Dark Souls, Zelda 2, and a Metroidvania game but all under the whimsical theme of bugs. As you venture into the depths to uncover elder secrets, you'll engage in challenging, fast-paced combat with treacherous creepy crawlies, and enlightening conversation with the more civil ones. The setting for Hollow Knight is a somber one, with a long and mysterious history. Upon gazing at numerous idols, temples, and contraptions, you'll find you've developed an insatiable desire to bring even a semblance of clarity to an eerie atmosphere of the excitingly unknown. It unexpectedly took me back to Dark Souls, and you'll find me drawing parrallels several times throughout this review. For starters, cryptic lore unfolds through line after line of well-written dialogue, and through many of the eccentric and outlandish characters you'll encounter on your journey. The many scripted pieces of elegant poetry are also worth highlighting as part of the comparison: they leave you clueless, but with goosebumps, a feeling any Dark Souls veteran is well acquainted with. That’s because Hollow Knight heavily leans and relies on the world imagined and then created by the developers, and the quality extracted by the players will only fall secondary to the hard, precise, and action-intense combat that makes for the reason we play game: solid gameplay. Fighting in Hollow Knight is very finely tuned and feels fluid with every movement, ability, and attack. With multi-directional swings, you'll find that combat pans out smoothly, even when battling its 140+ enemies and 30+ bosses, all who have precise hitboxes and challenging yet bearable attack sequences. Additionally and as you progress through the game, you'll discover many new skills and charms that not only fit in seamlessly with combat mechanics you already mastered, but also add to the experience that is exploring this universe. “Focus” is especially cool: you can channel energy collected when successfully landing hits, and use it to heal yourself or launch an overpowered attack. It’s a unique and intuitive feature that offers many approaches and strategies in fights, but all others are also valuable, customizable utilities to keep combat fresh while allowing it to evolve in depth and strategy. 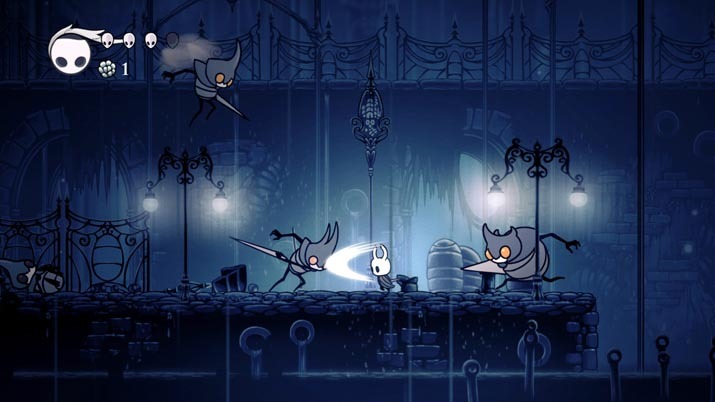 Hollow Knight is the pinnacle result of transcribing the Dark Souls formula into a 2D format. It's not like the developers callously forced the implementations that made the Souls series so successful into the husk of a dark and gritty side-scrolling platformer. Rather, they intricately molded the features of a AAA franchise into a new and distinct form. One they can call their own. Instead of bonfires, for example, are benches that act as save points and allow you to update your map with areas you recently discovered. Every boss fight is justified in its difficulty and is built-up by text reels that introduce the imposing foe you must defeat. And every time you die, you lose all your money, only to be obligated to return to your point of death and reclaim your spoils. That’s only to name a few. The fact is, there are many parallels to the Dark Souls series that are executed well while staying genuine to the individual title: they're not blatant copies, they're polished adaptations. Hollow Knight’s graphics are absolutely pristine. Neatly hand-drawn art delicately binds together each element in every scene. And as you explore the world, you'll become inspired by the grandeur found in the beautifully bizarre. The art direction is, to say the least, unique and refreshing. 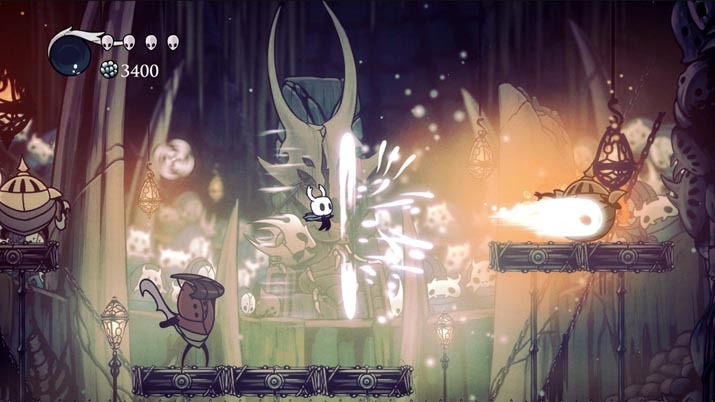 Package everything mentioned above with a gripping soundtrack and wealth of content, and you get Hollow Knight, a game many fans of the genre might consider to be what it might just be: a masterpiece from the indie realm. Team Cherry impressed in capturing and perfecting each aspect of a genre that suffers from overwhelming competition on Steam: 2D Platforming. 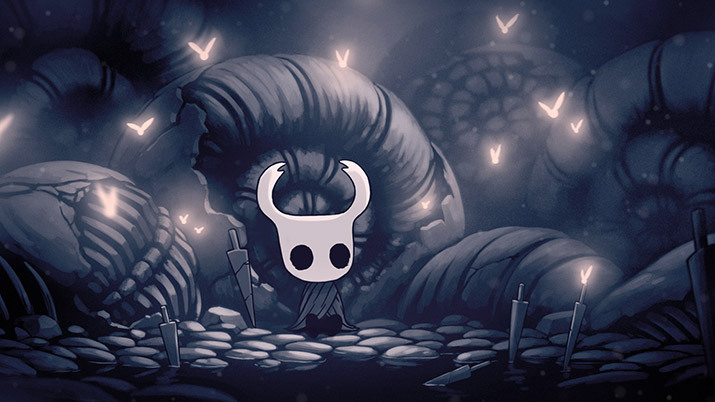 In sum, if you're a fan of any of the genres that have been brilliantly meshed together to compose Hollow Knight, I highly recommend you play it. Even if you aren't, play it anyways.